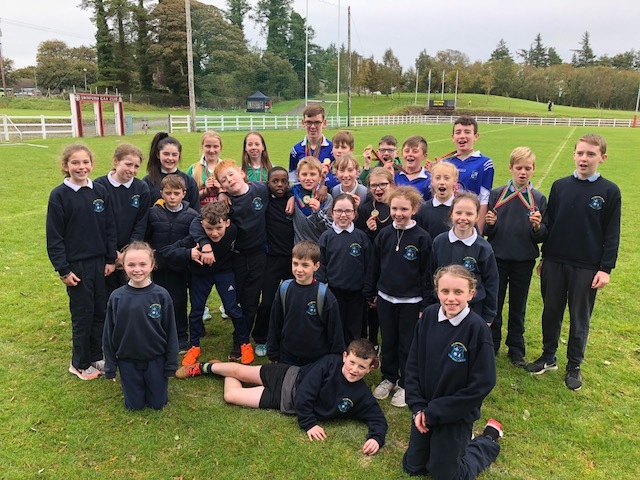 Well done to all the pupils in 3rd 4th 5th and 6th class who participated in the recent cross country competitions. Over 100 pupils participated in trials during September and all children enjoyed taking part. 24 pupils represented St Aidans in the East Mayo finals held at Swinford Golf course and all of them did our school proud. Shauna Lilly Doyle, Emma Maloney, Tom Smyth, Cáit Burke and Chloe Caulfield all went on to qualify individually for the county finals in Beleek Ballina on Thursday September 27th.while our senior Team – Oisín Mc Nicholas, Liam Smyth, Mikey Kearney, Oisín Mulderrig, Conor Prendergast and Robbie Irvine ( substitute for Darragh Mc Govern ) represented St Aidans in the senior boys race. It was a very enjoyable experience for all pupils. Shauna Lilly and Oisín took part in the Connacht finals in Loughrea on Saturday October 13th. Despite the very wet weather the runners did their best and were well placed overall.